Where are your estate planning documents? If you already have an estate plan in place, good on you !! Surveys are conducted all the time and the results are clear: Most Americans do not even have a basic estate plan in place. But, you aren’t basic. You’ve taken the time to establish your estate plan. If you’ve taken the time to establish an estate plan, make sure it’s still where you think it is and make sure you tell your family where you keep it. Not only will you be able to have peace of mind knowing it’s still there and available, it will also give you an opportunity to review your estate plan to make sure it still meets your desires and wishes regarding the disposition of your property upon your passing. Have you moved to a new state? If you’ve moved to a new state, it’s time to have your estate plan reviewed. An experienced estate planning attorney can make sure your Will complies with Georgia law. While a Will valid in one state is valid in another due to the Full Faith and Credit Clause of the U.S. Constitution, there may be nuances in the new state that you can use to your advantage. An experienced estate planning attorney will be able to spot those nuances. It’s time to review who you’ve designated as your beneficiaries on your life insurance policies and other financial instruments. Do you need to add a beneficiary? Maybe you’ve had an addition to your family. Do you need to subtract a beneficiary? Maybe you experienced a separation or divorce in 2018. Perhaps you’ve named someone who you are no longer close with as a beneficiary or perhaps it is someone you no longer have a business relationship with. Maybe you’ve named a minor child as beneficiary to a policy. If so, it’s time to change the beneficiary designation. That’s because a life insurance company will not pay out life insurance proceeds to a minor child. Instead, the company will make the Court appoint a Guardian for the child (even if the child has a natural guardian like a parent) and the Court will make the Guardian pay a surety bond for the life insurance proceeds. The bottom line is you shouldn’t name minor children as beneficiaries to any policies you have. Also review your power of attorney designations. Like the situation with beneficiary designations, it’s also time to review who you’ve designated as your agent on your Power of Attorney and Advance Directive for Health Care. Make sure that the person who you have designated is someone you trust to handle your medical and financial affairs if you ever get to a point where you are unable to handle them yourself. Review any life changes over the past year. Now is the perfect time to update your estate plan if you’ve had any significant life events over the past year. Perhaps you received a significant bonus during the holidays or perhaps you’ve had an increase in income or some other major financial event. Perhaps you got married. Perhaps you’ve had a birth in the family or perhaps someone important to you passed away. Maybe you blended a family this year and now have stepchildren. All of these are good reasons to review and update your estate planning documents. Last Will and Testament – everyone, no matter how young or old, rich or poor, can benefit from having a Last Will and Testament. As you are probably aware, a Last Will and Testament is the directions (usually written) for your loved ones on how you want your assets distributed after your death. Financial Power of Attorney – a financial power of attorney allows someone, perhaps a family member or trusted friend, to make decisions for you if you ever get to a point where you are unable to make decisions for yourself. If you ever get to a point where you are unable to make decisions for yourself and you don’t have a financial power of attorney in place, your family will have to sue you so you can be declared incompetent. Once the Court declares you incompetent, the Court will appoint a Guardian for you and the Guardian is the one who will start making financial decisions for you. My experience has been that, most times, the Guardian the Court appoints for you would probably have been the person you would have chosen anyway, so go ahead and prepare a financial power of attorney so your family can skip the Court. Advance Directive for Health Care – like a financial power of attorney, the Advance Directive for Health Care, allows a trusted person to do things on your behalf if you become unable to do them yourself. For example, the person will be able to talk to the doctors on your behalf, access your medical records, and things of that nature. Sometimes, these documents are just as important as a Last Will and Testament. If you pass away without a Last Will and Testament, don’t worry, your assets will still be distributed. Just maybe not in the way that you’d want. But, if you don’t have an Advance Directive for Health Care, it could turn into a nightmare for you and your family. Living Will – this is the document which describes your desires and wishes regarding the withholding or withdrawing of life-support systems. Many states, including Georgia, have combined this with the Advance Directive for Health Care. So, you won’t find a separate document for the Living Will in Georgia. However, many states still have the Living Will as a separate document to go along with the financial power of attorney and Advance Directive. As a piece of advice, go ahead and complete a Living Will or Advance Directive. I’ve often heard from people that their family knows what they want to have happen if they ever see an end-of-life situation. But, it’s not a decision you want to leave in the hands of your family. Do you really want your family to struggle with the decision on whether to pull the plug or not? I’ll answer that for you: no, you don’t. So, go ahead and complete a Living Will or Advance Directive and let everyone know what you’d like to have happen in that situation. A Trust – while a Trust is not a required element of a good estate plan, it can be very beneficial to some people. A Trust is a legal document that gives a trustee detailed instructions regarding the distribution of your assets instead of letting the Courts determine the distribution of your assets. Any assets that are in your Trust avoid the probate process upon your passing. The person who creates the Trust defines the terms and the instructions on how your assets will be distributed. For many people, avoiding the probate process is high priority and a worthy goal. Define your estate planning goals – There are many reasons to have an estate plan. For some people, they want to avoid the probate process. For some, they want to make their estate settlement simple. Some are concerned with an over-controlling daughter-in-law or a not-quite-perfect son-in-law. Some are concerned because they are in a blended family situation. All of these are valid concerns and there are many more possible concerns or reasons to have an estate plan. List your assets – This shouldn’t be too difficult, but it may not be easy to accomplish in one sitting. Your assets include things like real estate, investment accounts, and insurance policies. But your assets may also include things like your digital music collection, your Facebook account, and your online photos. Choose your beneficiaries – this is easier for some people more than others, but think about where you want your assets to go upon your passing. Most people want their assets to go to their family, but you can leave your assets to charities as well. An easy way to consider it is use percentages. Divide your assets up using percentages making sure the final number is 100%. Choose your Executor – remember, this is the person who will be distributing your assets when you pass away. In general, the executor can be just about anyone. But, you want to choose someone who is responsible and hopefully lives close to where the major assets are located. There may be upkeep of a home that is required or trips to the Probate Court may need to happen. While a person who lives out of state could be an executor, a person who lives close by may make a better executor. We wrote the book on estate planning in Georgia. 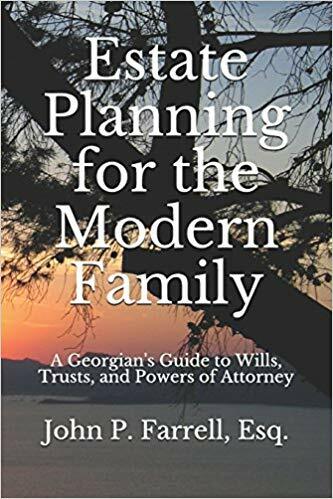 Estate Planning for the Modern Family: A Georgian’s Guide to Wills, Trusts, and Powers of Attorney by Author, former Magistrate Judge and Marietta Estate Planning Attorney John P. Farrell provides a step-by-step guide to estate planning in Georgia. Our reputation stands alone – “Excellent,” “Courteous,” “Professional.” These are not our words, but the words of many of our satisfied clients after having worked with The Farrell Law Firm. They are evidence of our past successes and what we strive for everyday. Over 15 years of experience – Licensed in Georgia, Tennessee, and Texas, our practice has grown through referrals of satisfied clients, referrals from other lawyers who know how to find the best estate planning lawyers in Georgia, Tennessee, and Texas, and the community where our reputation speaks for itself. We offer free consultations – not every lawyer will allow you to meet with them for an hour for free. We offer free consultations as a way to guide you through your estate planning process. Quite frankly, not every person is a good match for us as a client and we aren’t a good match for every person looking for an attorney. It’s difficult to know if you’re a good match or not unless you sit down with someone and learn their wishes, desires, and goals when it comes to estate planning. You can do this with us for free !! Our office is located right off the Square in Marietta, Georgia at 316 Alexander St., Ste. 3. Feel free to reach out to us by phone at (678) 809-4922 or simply stop by our office to meet our wonderful staff. We are hopeful that your 2019 has already gotten off to a good start. If you are planning on having some estate planning New Years Resolutions, the above is a great place to begin. Previous Previous post: Does a Will have to be Probated in Georgia?